It's probably not a great idea to lead with one of our favorite all-time projects. We should have saved it for later, but we just couldn't help ourselves. 1980, TAKE BACK YOUR SPACE! 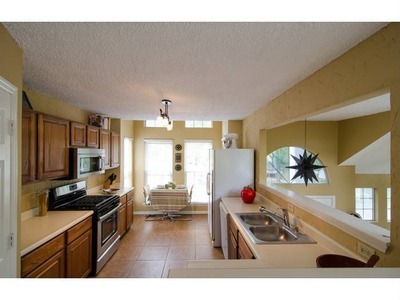 Though this kitchen in the same neighborhood has been updated and the wallpaper has been long hidden or removed, you can definitely spot the lack of granite, modern cabinetry, updated appliances, etc. 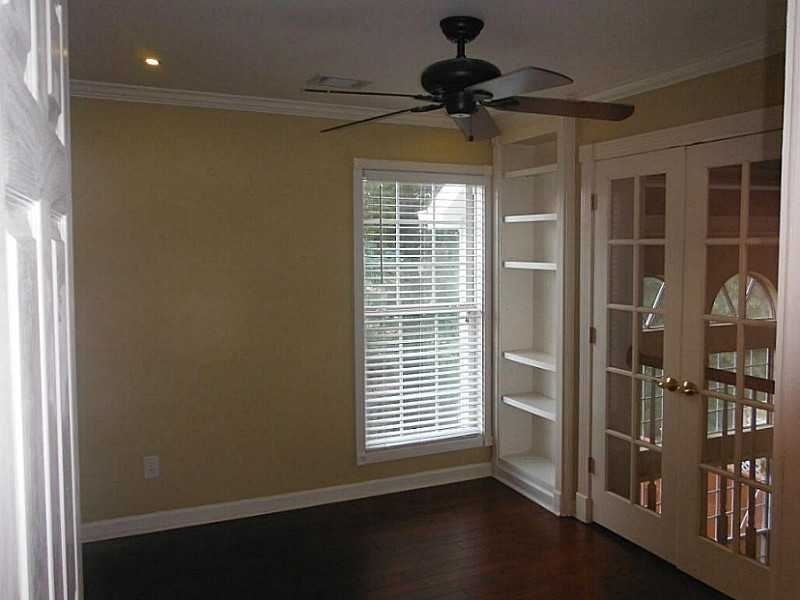 This is a beautiful property, but in remodeling, (rather than just updating), for north Atlanta, we felt like the upgrading had to reach a little farther - not just in the kitchen, but throughout the home. In envisioning the renovation, our entire house would require a major overhaul. Structurally it was sound, but aesthetically it needed a whole lot of oomph! And the AC needed replacing as well. But one of the most exciting spaces to redo was the grand living area on the main floor. This encompasses an open living space comprising the kitchen, dining, and living area with a loft on the second floor overlooking the living space. 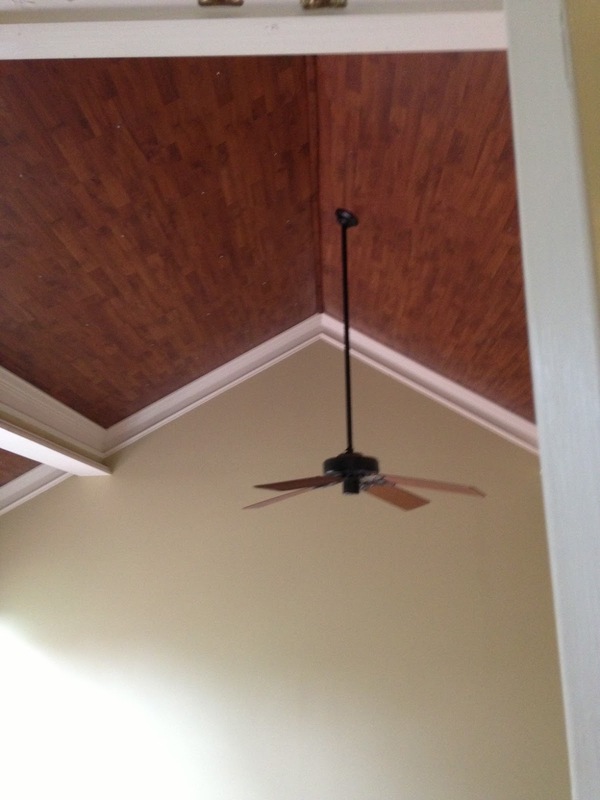 This post focuses on the closing in of the loft and replacing the vaulted ceiling with hardwood flooring! From the loft, the room had this sort of feel to it, except the walls were white in some areas or wallpapered with plaid, too-many-pink flowers, and so on everywhere else. 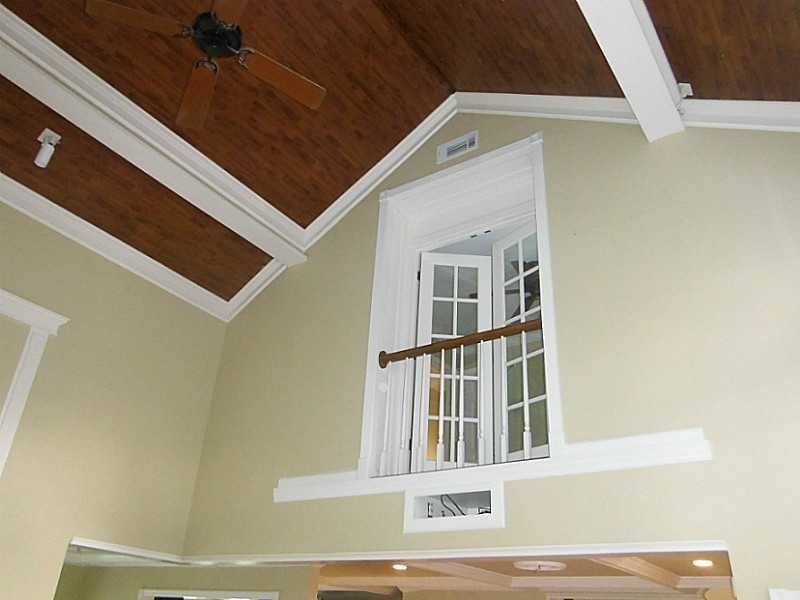 This is the loft from the same home shown above. 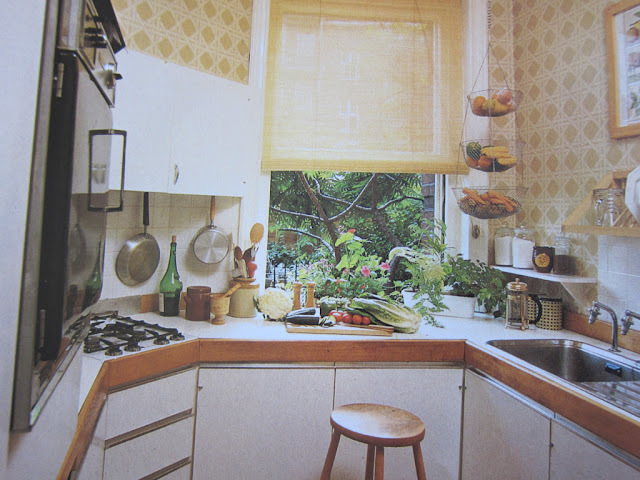 They really used color nicely, as in their kitchen, but we went a few steps further. The loft you see above? 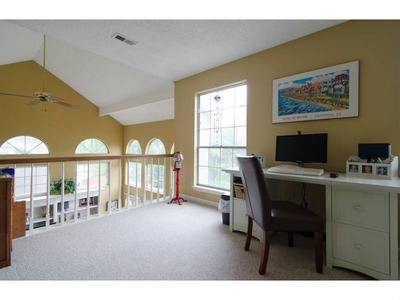 Our loft became an enclosed office, with built-ins and a Juliet balcony with French doors. It would make a nice third bedroom, but it is a wonderful space to work in. The wow factor is in the new vaulted ceiling. The ceiling is 15' at the sides and 20' in the middle. Steve felt like a darker color would bring down the space and make it more intimate. He said it felt like a racquetball court before the install. An amazing new look was created with the hardwood flooring in the place of that white, popcorn ceiling. The really amazing part of this is that it was a do-it-yourself job. If you are a little handy, it seems you might be able to manage a project like this. Steve bought and delivered the hardwood flooring himself. He rented the scaffolding. And like Michelangelo in the Sistine Chapel, he patiently installed the whole thing. If you're not that adventurous, it is certainly something a contractor can do.